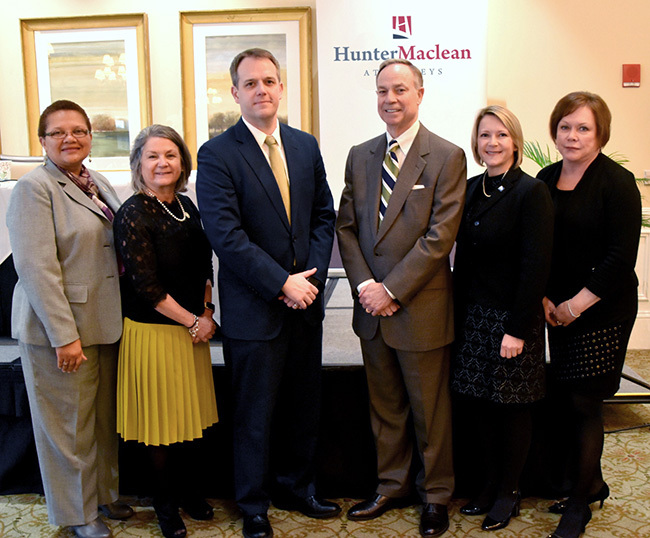 From billions in economic impact to the creation of a bamboo toothbrush, education leaders gathered on Wednesday to discuss the impact the Coastal Empire’s public higher education institutions have on Savannah and surrounding counties during HunterMaclean’s Critical Issues Forum at the Savannah Golf Club. The panel included Cheryl Dozier, president, Savannah State University; Michelle R. Johnston, president, Coastal College of Georgia; Kathy Love, president, Savannah Technical College; and Shelley Nickel, interim president, Georgia Southern University. Coastal College contributed $97.8 million and 1,143 total jobs – 322 on-campus and 821 off-campus across Glynn, Brantley, McIntosh, Camden, and Wayne counties in FY17. Georgia Southern’s impact was just over $1 billion and was bolstered during the year due to the consolidation between GSU and Armstrong State University. Savannah State contributed $187 million and accounted for 2,056 jobs – 605 on-campus and 1,451 off-campus. The impact was felt across Chatham, Effingham, Bryan, Liberty and Bulloch counties. Savannah Tech, which is a part of the Technical College System of Georgia, contributed $64 million, but Love also sites the additional earnings of the school’s graduates since job placement and workforce development are the driving forces behind the school. Johnston’s example of student success was a bit more personal – a bamboo toothbrush. Created by recent graduate Kynder Ganoe, the toothbrushes aim to help combat plastic waste. “I don’t think there will be as many people in the future who can give up five or six years of their lives to go to college away from a job, so what the community can do is send more students starting in high school to dual enrollment and get them engaged in college life,” she said.